The former France and Toulouse fly-half etched his name in European rugby folklore by kicking the French side to glory against Cardiff in 1996. With the scores level at 15-all at full-time Deylaud went on to kick a further two more penalties to seal a famous win. 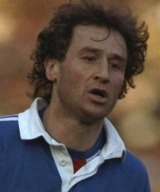 Deylaud won 16 caps for France between 1992 and 1995 and was selected for the 1995 Rugby World Cup tournament in which France were knocked out by eventual winners, South Africa. He won four French Championship titles with the French giants before going into coaching with former club Agen.